KFJC is well-known for its commitment to presenting the best in live music, wherever it occurs – from our studios in Los Altos Hills to venues throughout the world. 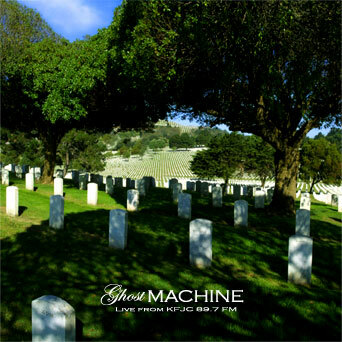 KFJC is proud to present the latest volume in our continuing series of collections documenting these live performances, “Ghost Machine: Live From The Devilís Triangle, Volume 5“. As always, an international cast of bands and a wide variety of genres are represented in this cornucopia of modern sounds. The “Ghost Machine: Live From The Devilís Triangle, Volume 5” 2CD is available as our thanks for your generous donation of $33.33 or more.